Tutorial: How to Spell "BOO"! Inspired by the season, Shelley of Singlestone Studios and I have put together a couple of projects to share with you this week. So swing on over to her blog after this for some more harvest inspirations! 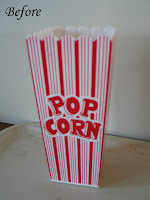 Here's my first contribution, a quick little project I created this weekend just for you bloggers! 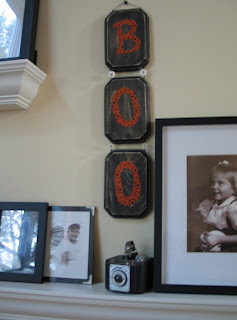 It's a little "Boo" sign that is both simple and cheap to create. I estimate that the entire thing cost less than $5. I did it myself but you could easily involve your kids in this one too! 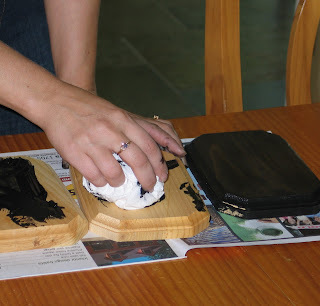 Step One: Glob on some of the chalkboard paint to the top of each plaque and rub it in with a paper towel. We're going for a glazed look so if you get too much in areas- wipe it off. I put just enough on to cover the wood completely, but still see the grain. Let dry. Step Two: I used my craft drill and put holes in the top corners and bottom corners on 2 of the plaques but on the third only drill 2 at the top corners. 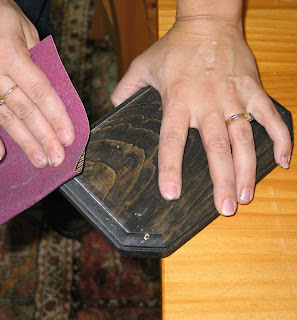 Step Three: Sand your edges to get a nice worn and spooky look. Step Four: Cut out a "B", and 2 "O's" from the orange fabric. I handcut mine but you can blow up the letters in your word processor and then print them out for insta-templates. Just hold the paper and fabric together and cut around your shape. It's an easy way to get a certain font. I think hand cut works pretty well for this project however. Rough looks nice here. Step Five: Cut about 12" of the wire and thread one end each through the top two holes of one of the 4 hole plaques. This will be the hanger, so leave a little slack and then wrap the ends around the wire and then trim excess. If desired you can make a little loop in the center where it will hang. Step Six: Cut 4 lengths of wire approx. 6" in length. Thread through holes from back and connect the plaques one below the other and so on. I spaced the plaques as I wanted and then twisted the wire. Then wrap one end around the other and then clip the excess. The second end gets trimmed to about a 1/2" length and then you insert it through a button. Wrap the wire over into the second button hole and then under for security and then trim any leftover wire. Do this 4 times to finish. So there you go 6 easy steps and you have a stylish and spooky bit of home decor you created yourself! This same project could be altered so that the plaques are side by side and say trick or treat or use a harvest theme such as Be Thankful. Instead of text you could also get creative and do a trio of bats or pumpkins. If you go harvesty painting the plaques a pumpkin or deep red tone and then accenting with a bit of gold paint would be very pretty. You could also use these to go 3-d. 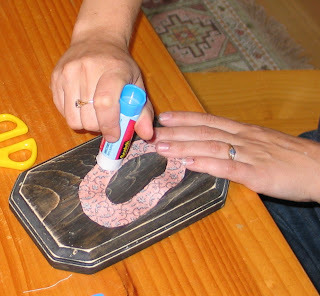 Simply drill through the plaque where you would like to add your skeleton keys or sticks or whatever and then wrap the item with wire and twist behind to secure. I think using old wallpaper on these would be fun too. SO a simple shape but lots and lots of places to go with it. I could see a triptych created from these as well. Local Craftiness: Crazy Fun Weekend! Sometimes you only have time for one load of laundry, do you yours or your kid's? I chose to do Jasper's and ran around town wearing whatever seemed cleanest all weekend. But it was an awesome few days. 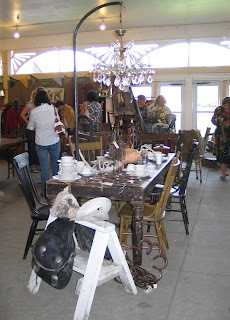 I started it early by throwing caution to the wind and taking my son to Junk Bonanza on Thursday for the Blogging Party. I sound dramatic but it's a big risk taking a 4 year old with to an event like that. Fortunately God smiled on me and I thought to call and invite my cousin to join us. We played tag team with Jasper and I got to meet some fabulous craft personalities. What I liked best however was meeting some local gals who I'll introduce you to in my next post. Fellow moms like Jill Hinson (who created the Thrify Mom's Challenge Table- which rocked), and artsymama (blogger extraordinaire!). I was completely blown away by the creativity of the vendors as well. I saw a bit on Thursday and then returned on Saturday morning with a friend to see the rest. When I got home I filled 4 sketchbook pages with ideas I had and sketches of what I'd seen. 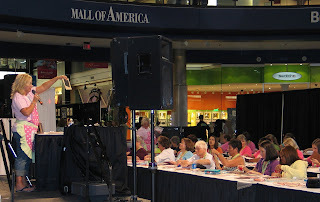 Two hours at home and then it was off to Scrapfest 2009 at the Mall of America. I'd registered for the Stylish Standing Desk Calendar workshop sponsored by Me and My Big Ideas. It was a good little project and I liked that they gave us a lot of extra materials. We got the majority of it done right there in class and I'll finish the rest up sometime this week. I took the class because I eventually would like to teach classes like this and wanted to experience one first. So between the blogging party I attended on Thursday and the Scrap class on Saturday I feel like I really did some positive things for my future art career. Yay! Local Craftiness: Junk Bonanza Coming SOON!!! Ok I almost missed this one. But I'd wandered over to the MNhandmade Ning group to leave a comment for Jenni of Smith's Infusion, when I happened to see a post about a blogger's party. Curious I clicked. A bonanza of happiness greeted me. For those who don't know( cause that was me 10 minutes ago), the Junk Bonanza is a wonderful happy place. But for more specifics I have a quote from their website. What the heck is the Junk Bonanza, you say? Y'all must be a newbie. 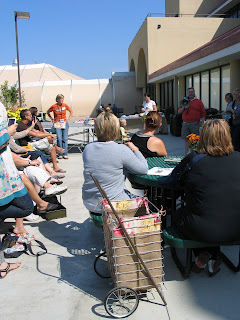 The Bonanza hosts over one-hundred juried “junk” vendors. These folks are harborin’ all sorts of vintage finds, from eye-popping antiques to one-of-a-kind old-timey wares. There are local harvest goods to get your taste buds tingling! We've also got plenty of activities going on, so be sure to check 'em out!" Sounds fun you say? It gets better! Matthew Mead who I mentioned last post, is going to be there as well as The Farm Chicks, and local fave Ki Nassauer. Who in my opinion is THE GIRL as far as upcycling and repurposing greatness goes. I'm also kind of excited to see the challenge table decor that Jill Hinson is creating completely from hardware store finds. We're starting to get into the season here and yesterday's shopping trip did nothing to curtail the urge I'm feeling to spookify my home. The first shop I walked into was brimming with cauldrons and witches and spooky spooky decor. LOVED IT! So I bought a few things and set them up while cooking dinner last night. I couldn't wait. Unfortunately that meant that my family did. We ate a little late. But when one feels the urge to decorate I say go for it! 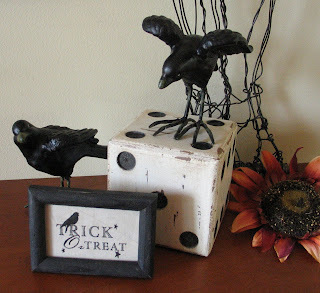 So I pulled out my bittersweet garland and played around with some crows I had purchased earlier. Very very fun. Then this morning I woke up with plans for adding some written wire words (BOO!) and a spooky tree. 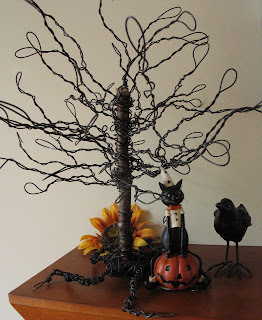 I pulled out a tree form I'd started a while back and finished the wire work on that and let Jasper put his little cat and pumpkin knick knack under it. He's always afraid I'm going to sell the stuff he likes so he made sure to tell me that it was NOT for sale. Kind of cute. I'm thinking it needs some spider webs and maybe a noose. Or some bats and ghosts hanging from it 's branches. I also have some boo-tiful orange and black fabric that I'm thinking might look really cute stitched to the leaves. Although that might be over kill. Still I like the idea. I've also got some plans for a big wire spider's web with a scribble spider to hang in my foyer. Or maybe we'll make the spider's body of fimo. Ideas... ideas! A big moon would be fun as well. And just to whet your appetite a little more... I want to introduce you to one of the most creative books I've stumbled on lately; Matthew Mead's Halloween Book. It's got one great idea after another and I just positively love them all. Party decorations, yummy spooky eats, stitched fabric moon quilts, and fabulous little needle felted pumpkins are just a few of the goodies in this must-have or at least must-look at book for the season. I love it! Oooh.. and in the next few days I'll try to post a few more scary ideas and I have a tutorial that's been requested as well. Lots and lots of fun you won't want to miss. And remember now...(insert spooky cackle here) YOU'Ve BEEN WARNED!!!!!!!! It's helpful for me to see all upcoming submission deadlines in one place so I thought I'd post them here and share them with you all too. There are also two other new publications that you might be interested in. Jewelry Affaire is described as featuring jewelry that is simple with an understated elegance. They are requesting submissions that are easy to understand and create but that radiate elegance. To view this Call you can click here. The second is All Things String. It is calling for art submissions that use string innovatively. Wool, strips of t-shirts, thin white yarn, hemp string, as long as it's string they want to see what you can do with it. I love the idea behind this magazine as well. You can knot, stitch, weave, knit, crochet, loop, pin, or braid it into jewelry, rugs, wall art, and furniture. Whatever you can imagine and create. Sounds like soooo much fun!!! The deadlines for these are Nov. 15th, and Dec. 1st respectively. These are Stampington publications, and to see the full write ups of the calls please click here. I've also looked at the Cloth Paper Scissors readers challenges and you can see those here as well. So take a look and if any of these get your creative juices flowing- give'em a shot!! If nothing else you've an amazing challenge to inspire you to create some amazing new art. What's not to love about that? The last week I've taken a bit of a break from the book projects to concentrate on designing and creating the decor for my local MOPs group meetings. MOPs is short for Mothers of Preschoolers- preschoolers being birth to age 6 or so. This is my fourth and last year- next year Jasper starts Kindergarten. With the book I didn't know if I could be as involved in the decorating and projects as I have in year's past but I found that it's one thing acknowledging that in my head and another actually giving up the position. At the leader's meeting I couldn't help opening up my mouth and suggesting things. Of course, once you suggest things and others agree it's pretty much up to you to execute the ideas as well. It was just sooo hard. The theme this year is "Together on Planet Mom" and I was pushing for the "go green and it's all one world" interpretation vs. the Space Aliens from another planet interpretation. I envisioned recycled decorations. For instance, using past year's purchases and adapting them to this year's theme. 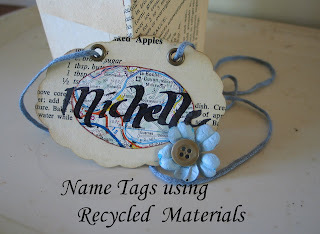 I also thought I'd use old cereal boxes for name tags and the bulletin board and recycle pages from old cookbooks and maps to pull in the Moms One World theme. So with this vision it was completely impossible for me to keep my mouth shut while they were talking space party decorations from the dollar store. I had fun though and recruited some help so it hasn't been too much and I'm pretty much done and ready to go back to the book stuff. Plus, I figured out that it's good to be focused but it's also important to be able to take a break occasionally and do something for fun. I had fun with the name tags but I had LOTS of fun doing a write up on the theme. It's titled Motherhood Manifesto. One of them sent me a link to submit it to the MOPs international site and crazy thing- they took it! I'd love to have you check it out. So taking the time to do something else had been good. Now I feel like I've escaped the tunnel vision I felt I had before and am able to start again with the book stuff a little refreshed. So that I guess is the moral to this story. WORK HARD but take a break once on a while and HAVE FUN, just cause, too! It's been a crazy summer weather-wise this year. Much cooler than usual. We seem to have gone from Spring right into fall with maybe a few odd days of 90's. Yesterday I saw my first orange leaves announcing the advent of fall. I do enjoy fall and fall colors are my absolute favorite to play with especially when I was doing weddings. Orange red callas with deep purple mums and chartreuse little kermit mums make me swoon. So this week when I decided it was time to restock the Etsy shop I created some fun springy blooms of wire and then indulged in some fall colored fabrics. I just loved working with these. So here's a photo of my springy-fall blooms and maybe the colors and patterns will get you thinking it too! The majority of them will be listed soon in my shop as well. YAY! Hi! I am a mixed media artist, wife, and mom (of a 9 year old boy) living in the Minneapolis, MN area.I hope you find both encouragement, and inspiration here. Thanks for visiting! To find out about this amazing organization that is rescuing children from the streets, protecting, feeding, loving, and teaching them about Christ, click here. Grab a Button- Thank You! All designs, narrative and photographs on Art as Usual are ©2009-2019 Art and Nature/Jennifer Swift. Content shared on this site should not be used, borrowed, or published for any reason without prior written authorization. Thank you! 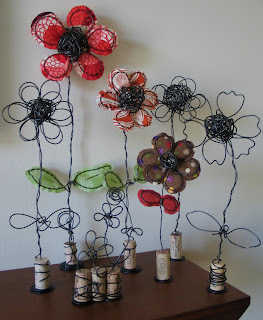 · Step-by-step techniques that show you how sculpt wire, stitch fabric to wire, make fabric pages and more! -Excerpt from my publisher, North Light's brilliant description of the book.